Heat half the oil in a large flameproof casserole dish and seal the beef in batches, turning for 4-5 minutes until sealed all over, then using a slotted spoon remove from and set aside. Once all the beef has been sealed, add the remaining oil and add the onion, garlic, herbs and lardons, cook for 3-4 minutes until the onion have softened and the lardons are slightly crispy. Add the mushrooms and stir for a further minute. Next add the tomato puree, then return the beef to the casserole dish, pour in the wine and stock. Season with some salt and freshly ground black pepper. Place in a covered casserole dish casserole and place into a preheated oven for 1hr 15 minutes, until the beef is tender. 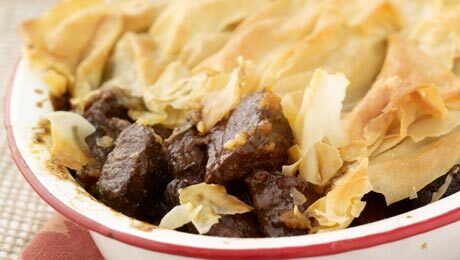 Remove from the oven and pour the contents into a casserole dish, add layers of filo pastry on top and return to the oven and cook for a further 20 minutes. Serve with some seasonal vegetables.